"Acoustic Transpositions in the Viggiano harp"
A Middle , at the House of the people of Settignano (via di San Romano 1, Settignano, FI; free admission , Tessa ARCI, UISP or Legambiente compulsory; info 055697007) Wednesday 17th April at 9.30 pm we hear “Trasposizioni Acustiche nell'Arpa di Viggiano "(Massimo Duino: mandolin, Luca Bersaglieri: guitar, Marco Massari: percussion, Vincenzo Arvia: diatonic accordion), an ancestral acoustic journey through the Lucanian musical imaginary: the soundscape of" endangered "rural communities in which, through music, we celebrate "the myth of the beyond". The tonal and harmonic varieties of Lucan music offer at the same time simple and complex atmospheres, historicizing present liquids, and humanizing places of being. Around 1600, in these places of Basilicata, famous sentences were pronounced, becoming "sound stories" and fairy tales (see the famous collection by Basile) that still reverberate in the minds of those who heard and read them during his childhood. The themes underlying the show are: the importance of the reference, "memory", the need for "display" in places where one arrives by force, for pleasure or because they are forced. The absence, the abandonment of places, the repertoire of traveling Viaggianesi players, the small permanent orchestras, are part of this musical synthesis performed by the four musicians. Through the Lucanian music and its archetypes, one is immersed in mnemonic symbologies with shared community origins. An experience in which the music and its acoustic sounds, made of accurate transpositions for classical guitar, mandolin, swing guitar, diatonic percussion organ and voice, testify that in the few elements that constitute each origin, the differences that characterize us are irrelevant. In "Trasposizioni Acustiche In the Harp of Viggiano" the music becomes journey, dream, departure, absence and labyrinth of existence, words are lost among fairy tales, myths, lullabies and tarantellas. Songs and music of love and celebration. A frontier music that is placed continuously on the border, if only to overcome it. "Middle" is a musical event born in 2017 from the idea of a group of young people attending the club, with the intention of creating a space to give the possibility to those who love music to perform. The first and third Wednesday of each month from January to December takes place inside the Settignano people's house, via di San Romano 1 Fi. The musical event is accompanied by a buffet aperitif from 20.30; groups perform from 9.30pm to 11.30pm . The consummation is reserved only to Arci, Uisp or Legambiente members (whoever does not have a card can request it at the bar, filling out the appropriate form, at a cost of 13 euros). Mandolin Massimo Duino. A pupil of Paolo della Giovanna, Alessandro Di Puccio, Joy de Vito and Simone Solazzo, he is a traditional music specialist from southern Italy; he collaborated with Gianfranco Narracci (singer and percussionist of the Medilatina and Tarantesys group) from whom he learned the techniques of tambourine-tammorra, and continued the study of the mandolin under the guidance of Mimmo Epifani (mandolinist of Eugenio Bennato), then with the mandolinist Peppo Grasso. In 2005 he founded the Kitammorre UFD, with which he participated in several festivals in Italy and France, and later the Lucania, with whom he recorded the album "055" playing in many popular music festivals among the most important. He is currently involved in the minimal music project Margretts, the noise music project Zeno in Coscienza, the project "In Folk and Reduction", and he conceived and created together with the guitarist Luca Bersaglieri the musical project "Acoustic Transpositions in the Harp of Viggiano. " Chitarra Luca Bersaglieri, from Molise, studied classical guitar with Fernando Lepri and Giuliano Balestra (pupil of Pujol and Andrés Segovia), later jazz guitar and improvisation with Gianni Zei, extending the study to swing guitar, merging traditional practices with deriving techniques from classical and flamenco guitar. He has taken part in numerous popular music festivals in Italy and in Europe. 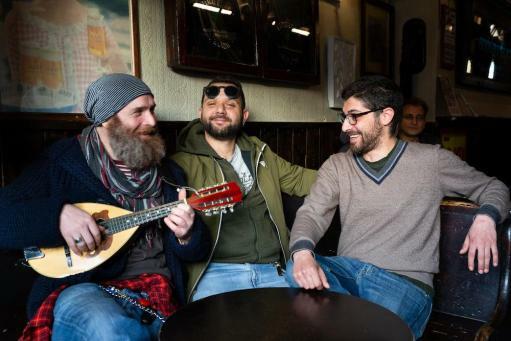 He also plays in various punk, reggae and popular music formations; together with the mandolinist Massimo Duino he conceived and created the project "Acoustic Transpositions in the Harp of Viggiano". Percussions Marco Massari, student of Gianfranco Narracci and element of the Kitammorre UFD, of Lucanìa, of Sanacore, Mezaluna, Margretts, Tetras, In Folk and Reduction and “Trasposizioni Acustiche nell'Arpa di Viggiano”. Vincenzo Arvia, diatonic organ from Alessandria del Carretto (CS), where he began playing the frame drum by observing the local players and accompanying the tarantellas of the town. At the age of eleven he began studying modern guitar with the jazz guitarist Umberto Tricca. At the end of 2016, at the age of eighteen, he began to study the diatonic accordion, first approaching his country's traditions that were handed down by oral tradition and then, thanks to the multi-instrumentalist Luca Bannella, he trained on the performance of pieces from the French tradition. Begins to perform in 2017 with Lucania; then with "Trio a Soffietto" with Luca Bannella and his father Carmelo Arvia and collaborates with Enzo Mileo and Ettore Bonafè. With Massimo Duino he is also in the training "In Folk and Reduction".